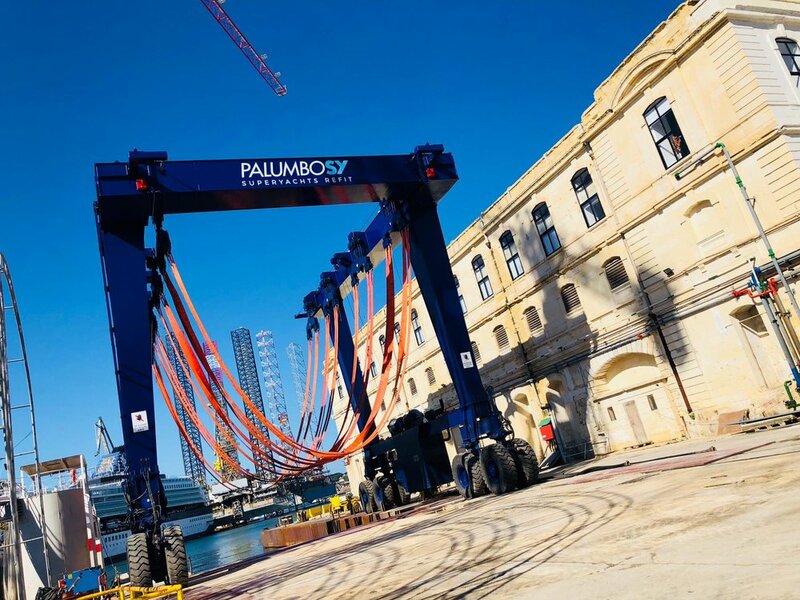 Travel Lift testing at Palumbo Malta Superyachts Palumbo Malta Superyachts, thanks to the wide berthing areas (340mt), to its 2 covered docks (160mt and 140mt) and to a floating dock by 700 tons, it’s already a renowned destination for superyachts in the Mediterranean. The Palumbo Malta Superyachts, which is one of the 5 refit shipyards that represent the largest maintenance and repair network of superyachts in the Mediterranean, in addition to these infrastructures, it can now boast the completion and the testing of a travel lift by 420 tons. This infrastructure consists of 16 wheels and 8 groups of lift belts. This ensures a rapid lifting and placement on the hard of medium-sized yachts. Thanks to this infrastructure, the Palumbo Malta Superyachts is completed in a real "luxury village" for Superyachts where one – as well as finding the biggest facilities in the Mediterranean with high levels of professionalism – can find a yacht chandler, a gym, one wellness center, outdoor and indoor recreational areas, one food court for a quick lunch, and also the option of luxury accommodation. All this completes within the Palumbo Group, which includes the Superyachts division with the new build brands Isa Yachts, Columbus Yachts and Mondomarine and the largest refit network in the Mediterranean with its 5 shipyards in Ancona, Malta, Marseille, Naples and Savona.